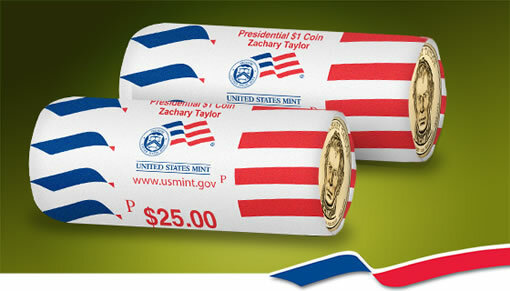 Buyers have toward the end of this week to purchase Zachary Taylor Presidential dollar rolls directly from the United States Mint. As previously described in a last opportunity announcement involving several products, the Mint will stop selling the rolls on Friday, November 18, at 12:00 noon ET. Almost two years ago the United States Mint sent the image above in an email to customers reminding them of the availability of Zachary Taylor Presidential dollar rolls. The rolls go off sale on Friday. 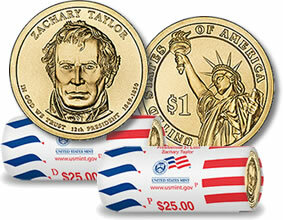 Zachary Taylor Presidential dollars were released within rolls by the United States Mint way back on November 19, 2009 — the same day they entered circulation via Federal Reserve Banks. Buyers then had an option to purchase Philadelphia or Denver minted $25 coin rolls for $35.95 each. Those choices remain available today through the Mint’s website at http://www.usmint.gov/catalog or by calling 1-800-USA-MINT (872-6468). The Zachary Taylor dollar was the final 2009-dated issue and the twelfth release overall from the Mint’s Presidential $1 Coin Program. The series honoring American Presidents kicked off in 2007 and is expected to last at least until 2016. Four former Presidents are celebrated each year. Nineteen have been honored thus far, with the Presidential dollar featuring James A. Garfield, the 20th President of the United States, scheduled to launch Thursday, November 17. United States Mint facilities in Philadelphia and Denver are responsible for producing all American coins for circulation. Corresponding mint marks of "P" or "D" can be found on the edge of each of the Zachary Taylor Presidential dollars. (The edges also include ‘E PLURIBUS UNUM’ and ‘2009’. Taylor coins are one of the scarcest in the series. The United States Mint produced a total of 78.26 million, with 36.68 million from Denver and 41.58 million from Philadelphia. United States Mint mintage figures are currently available for the first 19 different Presidential dollars. Of those, the 2009-D Zachary Taylor is the second most scarce from Denver, falling only behind the 36.54 million 2010-D James Buchanan $1 coins. The 2009-P $1 is more common as it ranks seventh most scarce of the Philadelphia minted $1 coins. Zachary Taylor, nicknamed "Old Rough and Ready," was the country’s 12th President and served from 1849 to 1850. He entered office while tensions were growing between the North and the South regarding slavery. He was a plantation owner and slaveholder, but he was also a military man and a nationalist. So when the South threatened secession, he said he was willing to use whatever force was necessary to stop them. Taylor fell ill during his second summer in office and died within days. I was given my grandfathers coin collection after he passed away. I came across a coin. On the front (ZACHARY TAYLOR 1849 12th PRESIDENT U.S.A. 1850). On the back (“OLD ZACH” HERO OF MEXICAN WAR). Hi Brenda, I also inherited the same coin from my grandfather after he passed away. Have you come across any other information detailing its circulation/history/etc?